When connecting VZ-R to a display or projector via HDMI, please make sure that there is also sufficient USB power. We recommend plugging VZ-R into a USB wall adapter, much like the one you would use for a smartphone or tablet. A 5V/1A USB adapter should be just fine. Many USB ports available on TV's will not provide sufficient power. Most projectors with USB ports should provide enough power, however, we recommend plugging into a wall adapter just be safe. A green LED will indicate that the VZ-R has sufficient power and the white LED indicates that it providing image to your display's HDMI input. Unfortunately, no. VZ-R cannot project its image via its USB and HDMI ports at the same time. You can, however, connect your VZ-R to a computer via USB and then connect the computer to a projector/TV to get an image at both locations. Please note that an HDMI connection will always take priority over a USB one. Audio capturing is only available for VZ-R’s USB mode as VZ-R’s built-in mic is only functional in USB mode. Video recording is only available for VZ-R’s USB mode. 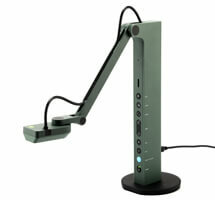 With IPEVO Visualizer software, VZ-R supports image snapshot as well as video recording. Please make sure you’ve connected VZ-R to an HDMI Input port on your computer. VZ-R will not work with an HDMI Output port. Please check the electrical frequency of your country. If it’s running on 50Hz, do change VZ-R’s frequency to match it using the Frequency Switch placed at the back of VZ-R’s body. If it’s running on 60Hz, do change it to 60Hz. Connect it to an outlet using any of your phone or tablet 5V/1A USB power adapter and the included Micro-USB cable. Connect it to the powered USB port of a TV, projector or computer using the included Micro-USB cable. Connect it to a power bank/portable charger. You do not need to install any driver to use VZ-R. When in HDMI mode, you can connect it directly to your HDMI display. When in USB mode, VZ-R uses a UVC (USB Video Class) driver that is available by default in your operating system.